A trial date has not been set for an American journalist facing espionage charges in Iran, and her lawyer will argue Saturday that she be released on bail until the case goes to trial. 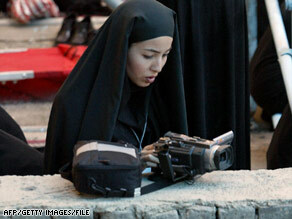 Roxana Saberi was charged with spying, with Iranian authorities saying she has confessed to doing so. Abdolsamad Khorramshahi, Saberi’s lawyer, said Thursday that he has not had a chance to view his client’s file and will seek permission to look at the file this weekend. Khorramshahi said Saberi’s parents were in Iran this week and met with their daughter for a half-hour Monday. He said they were holding up well and intend on staying in the country until the case is resolved. Iran’s Press TV reported Wednesday that Saberi “conducted spying operations in the country by passing herself as a journalist.” Watch why Saberi faces espionage charges » “She has accepted all charges and we have documented the evidence in her legal case papers,” said Hassan Haddad, Iran’s deputy prosecutor for security issues, according to Press TV. Saberi’s father, Reza Saberi, said in March that his daughter called him on February 10 and said she’d been arrested 10 days earlier. Amid reports that Saberi had been charged, Secretary of State Hillary Clinton said the United States was asking the Swiss government, which represents U.S. interests in Iran, to obtain the most accurate, up-to-date information about the 31-year-old freelance journalist. “I and the rest of the department will continue to follow this very closely and wish for her speedy release and return to her family,” Clinton said at the State Department. Haddad said Saberi’s case will be sent to the revolutionary court. Although she holds Iranian and American passports, the deputy prosecutor said her U.S. citizenship will not affect legal proceedings, Press TV reported. “She entered the country as an Iranian citizen and holds Iranian residency, passport and national identity card,” he said. Reza Saberi said his daughter initially thought she was detained for buying wine. “She said she bought a bottle of wine last year and kept it to take to a friend for her birthday,” he said. “She said authorities told her the person who sold her the wine turned her in.” Alcohol is banned in Iran. Wednesday’s Press TV report, posted on its Web site, reported that Saberi was arrested in January for working illegally as a journalist after her press card was revoked in 2006. Iran’s Foreign Ministry spokesman Hassan Qashqavi also said in March that Saberi had been working in Iran without a permit. “Her press card was revoked,” Qashqavi said. “Without a permit, she should not have been engaged in news and information gathering in Iran.” Qashqavi did not provide details as to why her press card was revoked. Saberi’s father said she has freelanced for National Public Radio and other news organizations and was writing a book about Iranian culture. He said his daughter was almost finished with the book and planned to return to the United States later in April.